From the latest report posted by Tubular (Q2 2018 State of Online Video) influencers are still a leading category for audiences. Paying attention to the latest trends can show marketers how to utilize this underused group. When it comes to social video’s largest platforms – YouTube, Facebook, Instagram, Twitter, and Snapchat – influencers are dominant. 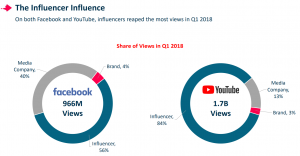 According to the Q2 2018 State of Online Video by Tubular, Influencers make most of the uploads and reap most of the views when compared to brands and media publishers. On Facebook, 56% of views are from Influencers and 40% by media companies. On YouTube, the difference is even greater, with 85% of views coming from Influencers. 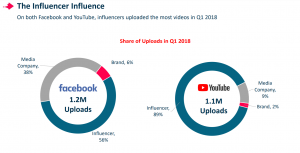 Influencers also lead in the number of videos being uploaded, with 56% again coming from Influencers. On YouTube, it was even higher at 89%. Additionally media companies are being beaten by influencers on both platforms. In YouTube’s case Influencers upload 10x that of any media company. These Influencers have a unique understanding of their audience. They also know how to capitalize on social trends for their dedicated group of fans. What are some of the more popular social video trends? Part of the allure of Influencers is that audiences crave to learn more about their lives and they are willing to share. 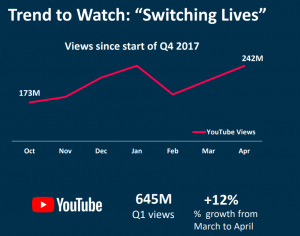 Many people say that social video became successful because of its ability to transport its viewer into another person’s life, world, and experiences. New popular video trends illustrate the fascination people have with the lives of Influencers. One trend that appears to be gaining steam is ‘Switching Lives.’ Here, a creator will switch clothes, accessories, and possessions with another creator. Switching Lives videos allow viewers to see what their influencers wear and own while giving Influencers an opportunity to share audiences. Another trend called ’24 hours’ gives the audience a sneak peek or a ‘day in the life’ of a creator. Some of the most famous creators are travel guides that take you through a day in a new city or area. Others take you through a typical day of an athlete, actor or celebrity. 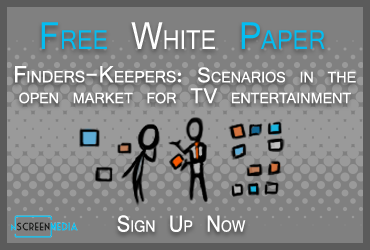 These videos have grown in popularity, increasing by 54% on Facebook and 84% on YouTube. Switching Lives and a Day in the Life offer opportunities for brands to showcase their products and services. If an influencer uses a product or service during their day, its usefulness can be easily demonstrated to the influencer’s dedicated audience. Finding methods of leveraging these trends could be very beneficial for companies looking to reach a specific demographic. If brands are looking to cash in on these trends, it helps to find to find the right influencer. A good candidate might be one who is rising in popularity and speaks to an audience rich in potential customers. One example is Big Marvel, who does covers of songs on large instruments and then imitates them on much smaller and cheaper instruments. His videos on YouTube have caused him to rise from #702 influencer back in January to #461 influencer in March. He is popular with young adult Asian and Asian-Americans, some of whom may also be musicians. Big Marvel is appealing to many brands wishing to reach this demographic. There might be clothing brands catered towards Asian-Americans or companies who sell quality or cheap instruments. Getting Big Marvel to feature a brands products could reach his 5.5 million subscribers. The reach could be enhanced if delivered during a trend event. If Big Marvel decided to showcase his new Google Home device during his ‘House Tour’ video over a million engaged users could see the device. Most of these creators are easy to contact and are eager for deals. However, few large companies recognize the potential of these Influencer audiences. It could be time for that to change.